The NAFTA has been in existence for a two decades, but its origins reach back further. The tri-partite treaty represents the culmination of a series of prior talks and landmark agreements that occurred on the North American continent – centering on three primary phases – and its impact on trade has been measurable. While the agreement has had its detractors from the beginning, it is nonetheless apparent that the numbers demonstrate that it has increased the volume of trade transacted between its signatories. This is particularly true in the realm of manufacturing. An important precursor to the NAFTA was the US-Canada Auto Pact of 1965, which was an answer to strong nationalist pressures in Canada to become self-sufficient in automobile production, the most dominant aspect of manufacturing trade among the two neighbors. Canada and the US cooperated aggressively to create a broadly based sectoral free-trade accord, in spite of the fact that such a limitation to one industry was in violation of the General Agreement on Tariffs and Trade (GATT) system, which only permits trade agreements that include substantially all of the trade among members. The resulting Pact produced rather balanced and swift growth in the largest manufacturing sector of trade, and was of particular benefit to Canada. Yet amidst strong opposition in the 1980s, then Canadian Prime Minister Brian Mulroney proposed a far-reaching comprehensive trade agreement to build on the success of the agreement of 1965. US President Reagan encouraged and promoted the move, and negotiations between the countries were concluded in August 1987. The agreement was comprehensive in eliminating tariff and non-tariff barriers to trade, and making provision for more cross-border investment. Only a few sensitive sectors were excluded by both countries. In the next decade, the results once again proved successful with Canadian exports to the US almost doubling from 25% of GDP to nearly 50%. Capitalizing on the early success of the 1987 agreement, representatives from both countries wasted no time seeking to craft yet another, even more comprehensive, agreement that would expand on this base – this time including Mexico, a developing economy yet to be fully industrialized. In fact, it was Mexican President, Carlos Salinas, who initiated discussions with President George H. W. Bush concerning a North American Free Trade Agreement (NAFTA) in hopes building further upon Mexico’s economic reforms of the 1980s to include a regional and international scope. 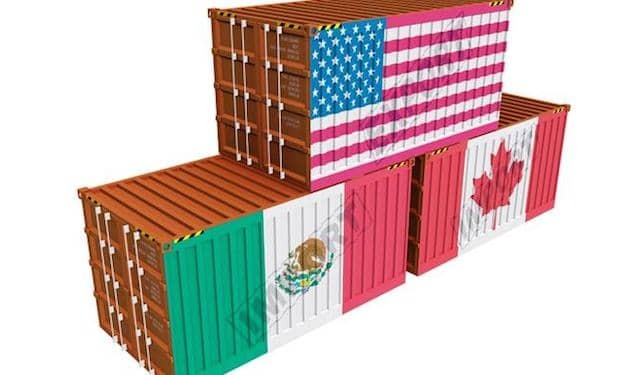 The presidents of Mexico, the US, and Canada eventually signed the the NAFTA in December 1992. It came into force on January 1, 1994. The impact of the NAFTA on manufacturing is apparent in recent numbers. Manufacturing trade was up in 2013 accounting for 77% of total US exports, and 63% of total US imports. Manufactured exports among NAFTA nations grew by 52% from 2009 to 2013, considerably faster than the 34% export growth with the rest of the world – and NAFTA manufactured exports were more than five times more than the total exports to China. This growth is most obvious in relation to US-Mexico trade with US manufactured exports to Mexico increasing by 69% in 2013, yet only 41% for exports to Canada. The next phase in North American free trade may see Mexico emerge as the biggest winner of all.